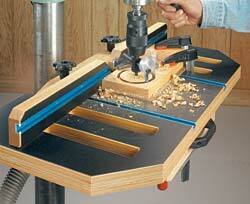 My next project, Drill Press Table & Fence System by ShoteNotes. A Table (1) 151/4 x 28 - 11/2 Ply. C Filler Plates (4) 43/8 x 43/8 - 3/4 Ply. I Base Bottom (1) 111/4 x 11 - 3/4 Ply. J Base Top Panel (1) 83/4 x 11 - 1/8 Hdbd. K Base Vacuum Port (1) 3 x 3 - 3/4 Ply. N Drawer Bottom (1) 71/4 x 83/4 - 1/8 Hdbd.